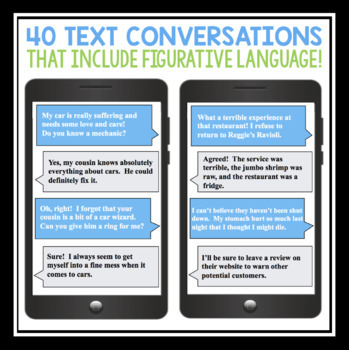 FIGURATIVE LANGUAGE ACTIVITY: TEXT MESSAGES: This resource helps your students practice identifying figurative language (metaphor, simile, hyperbole, personification, alliteration, onomatopoeia, and oxymoron) in a fun and modern way -by searching for them in text message conversations! • 40 Task cards with original text message conversations that include a variety of figurative language! Students are asked to read the text message and locate examples of metaphor, simile, alliteration, hyperbole, onomatopoeia, personification, and/or oxymoron. Two versions of this document are included: One for easy printing of a set of task cards, and another version with two of the same task card per page, so you can complete one a week to last you the whole year! 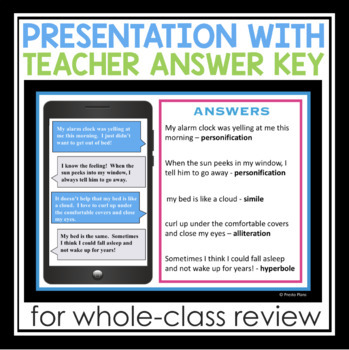 • An 80 slide Powerpoint presentation that prompts students to find the figurative language in each of the text message conversations and a detailed, animated answer key for class review! 1. FIGURATIVE LANGUAGE TEXT MESSAGE OF THE WEEK: Put the text message of the week up on the screen once a week to start your day. Have students complete the ready-to-print task card independently or with a partner. Go over the corrections as a class with the animated Powerpoint! This will last you the whole school year! 2. 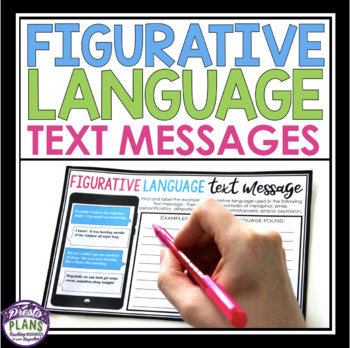 TEXT MESSAGE FIGURATIVE LANGUAGE GROUP WORK:Have students work in a pair or with a group to find the figurative language. Have each group volunteer to share and explain the examples they found. 3. 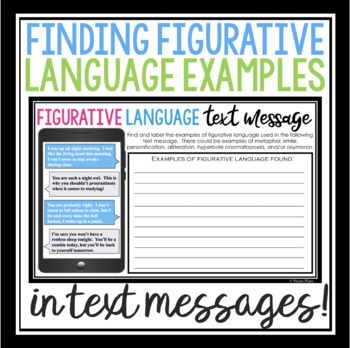 TEXT MESSAGE FIGURATIVE LANGUAGE TASK CARDS: Have students complete these task cards during centers or as enrichment. Print out the teacher answer key and have them check their work to see if they were correct!